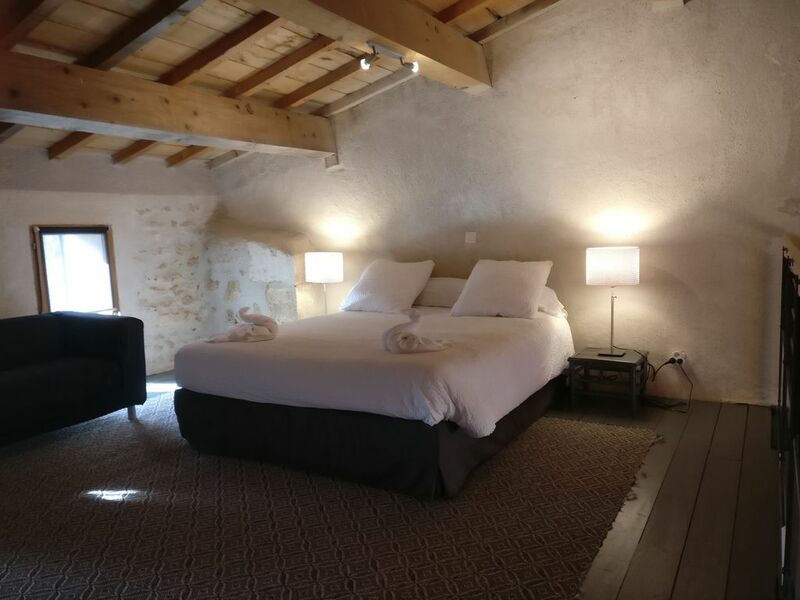 Just opened in January 2018, the Pigeonnier is a new studio loft gite in a 17th century building. At 44 square meters, it has one large loft bedroom with a 160 cm bed, a new Arthur Bonnet kitchen, living area and 1 bathrooms with white tile and Italian walk-in shower. The garden has seating for two. NEW in summer 2019 : We will have new outside petanque and volleyball courts as well as croquet. Not easy to find, but if you see Leroy Merlin you are almost there. The owners have undertaken a lot of renovation. The setting is lovely and it was nice to have a suite with a patio that opens onto the garden. This makes it very dog friendly! The bedroom was upstairs in the suite-the stairs are a bit steep. The bathroom only has a shower, wash basin and toilet and is a bit small. The kitchen is well equiped. Breakfast was a highlight-really excellent, and only €8.00 each-a real bargain. The day today running of the establishment is by Emma who is very helpful. The only real negative was no English language TV channel was available. A very beautiful Place / accomodation to stay. Chambres d’hôtes dans un château niché dans les arbres mais à côté d’Angouleme. Bienvenue chaleureuse et gîte avec tous conforts. Petit déjeuner incomparable! Piscine des rêves. Je reviendrai aussitôt que possible. C’est les cinq étoiles!!! Impossible de trouver un point négatif....tout est parfait : l'accueil chaleureux, le gite, la situation, le calme....une très belle découverte....qui n'incite qu'à y revenir !